I’m doing a blog giveaway over this weekend, one lucky reader will be getting a parcel with lots of goodies in it: 2 pairs of Christmas earrings, a copy of one of my favourite picture books, a travel version of Connect Four, some yummy chocolate and a scrumptious scented candle. Click through for details and to enter. If you look closely you can see that Adam was an expendable Santa. This morning I went into Caitlin’s room to see how she was going getting ready for school. We had to leave early as there was a dress rehearsal for the school dance group on at 7:45am. She’d just finished getting dressed and was shrugging on her denim jacket when movement caught my eye and I looked down to see a large-ish (about 1.5cm) black house spider running up her jeans leg past her knee and heading further north. I was rather surprised to find myself not hesitating at all to reach out and brush it off with my bare hand. They’re poisonous but not deadly, if you want to see what one looks like there’s a very good shot here on Flickr. We have them all over the outside of the house, I think this one probably got in through the damaged flyscreen on the sliding door leading from Caitlin’s bedroom to the back deck. Fixing of flyscreens is going on the to do list for the weekend. We love writing them, and we love reading them. But most of all, we love sharing them. At this time of year – as the sky goes dark by 4.30 pm in Wales, where we live, and the cold wraps around us, chilling to the bone – what we really want more than anything else are stories that make us laugh and feel good about the world. So we thought we’d gather some, and share them with with you, as our December Lights Project. You can read the stories here. Don’t forget to head on over to Half-Past Kissin’ Time for more Friday Fragments! Blog giveaway: From me to you – a gift. So much offered here today, Mimbles! I've got to rush off to work but will be back to enter your giveaway and check out the links! 🙂 Have a great day! I did NOT need to read that spider story! I also didn't need to know that they were poisonous, and I certainly didn't need to click on the link to the picture, but I did anyway. I'm going to be shivering all day! Shivers!! Oh that spider looks nasty!!! I can't see the photo of Adam. Sounds like he had a great time with the kids though! We're nearly dark by 5pm here in eastern US. I'm going to check out your giveaway! Your husband did a great job! Those poisonous spiders all around your house is scary! Amazing what mothers do for their kids when it comes to their safety–great going mom! I'm off to check out that spider picture now. Looks like your husband had a great time! The only worse than a spider getting in would be a snake. Hate those things! I think I'll pass on the picture of the spider…it would creep me out too much! So glad you saw it though! Thanks for visiting and commenting this morning! Summer is not my favorite time of year either…too dang hot! I think looking like Santa as you age is good goal. Little confused – maybe I'm mixing up my Wales. You're in OZ so the days should be getting longer and warmer if my geography is correct but that last bit says the opposite. Is that from the opposite Wales? 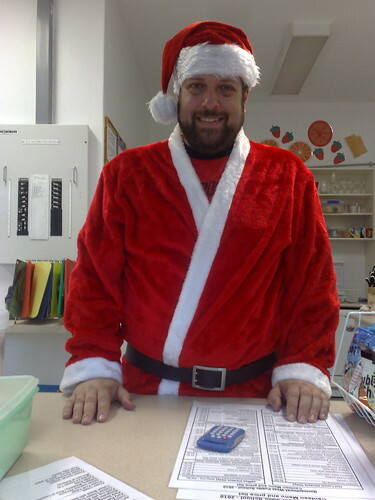 Adam makes a very handsome Santa! Spider – you were so brave not to freak out in front of your daughter. Whew! I'd have to agree with Unknown Mami – your husband does make a handsome Santa. Oh My! I was going to say something about Santa, but the spider… the SPIDER on your BABY… okay, I know she's not a baby, but you can see where my mind went… I'm still stuck on the spider… you handled it well, I can't say I wouldn't have freaked out and caused all sorts of drama! LOL, Santa has a great smile, but he needs to put on some weight. Spiders in the house? A common theme around here.